I've been performing patch diffing on various windows based softwares for past couple of years now. Patch diffing is a process of comparing two binary builds of the same code – a known vulnerable one and the one containing the security fix for a vulnerability. Bindiff is very popular among security researchers because it is generally used to gather information about patched security vulnerabilities, find root causes and vectors. In 2017 December I've delivered a talk at BlackHat Europe where I've showcased many patched vulnerabilities in VMWare workstation, mostly identified using binary patch diffing different releases of VMWare workstation. Performing BinDiffing on a huge software is very challenging specially when affected components are not known. Let's take the example of VMWare workstation. If we unpack VMWare workstation installer we find nearly 300 binary files. Among these huge number of binary files, finding the components on which security fixes were applied is very difficult and time consuming. Especially for my VMWare research I had to do this on a cumulative basis because I had to analyze each and every released security patches of last one year. Following screenshots lists out VMWare workstation releases and their version details. Performing binary diffing on each and every patch released by vmware for last one year was indeed very tedious. So I thought of automating the whole process. In this blog post I'm going briefly explain the way it was done and also release the source code of the python library I've written to automate this. The same code can be re-used (with little modification) to perform cumulative binary diffing on any windows based software. For other softwares files can be directly taken from "Program Files" folder. After the installer files are unpacked they are kept in an organized way in same directory. Point to be noted here directory structure of all the unpacked file should be same like this because these paths would be accessed the the Mass binary diffing program. 2. The program traverses two directories, tries to find out files which can have binary code and create a mapping between the old version and new version of the file. 3. After the mapping is created it checks if the binary image version has changed in the new release or not. If binary images are identical in both the releases nothing will be done to those files. 4. Next, if it finds any change in binary image file version it process them. First it generates set of IDB files for both old and new version. 5. From the IDB file it generates BinExport file with help of zynamics binexport. 6. From BinExport files it generates BinDiff file. Point to be noted here BinDiff files are nothing but a sqlite database, where all the diffing results are stored. Simple sqlite query can be made to extract information from the BinDiff file about the modified function in two binary files. 7. Next step, BinDiff database file is parsed and modified function details and addresses are extracted from BinDiff database. 8. Once these information are gathered a MS Excel report is prepared which gives a visual representation of the modified components. Following screenshot shows a sample MassDiff output for VMware-workstation version 12.5.1 and 12.5.2 release. 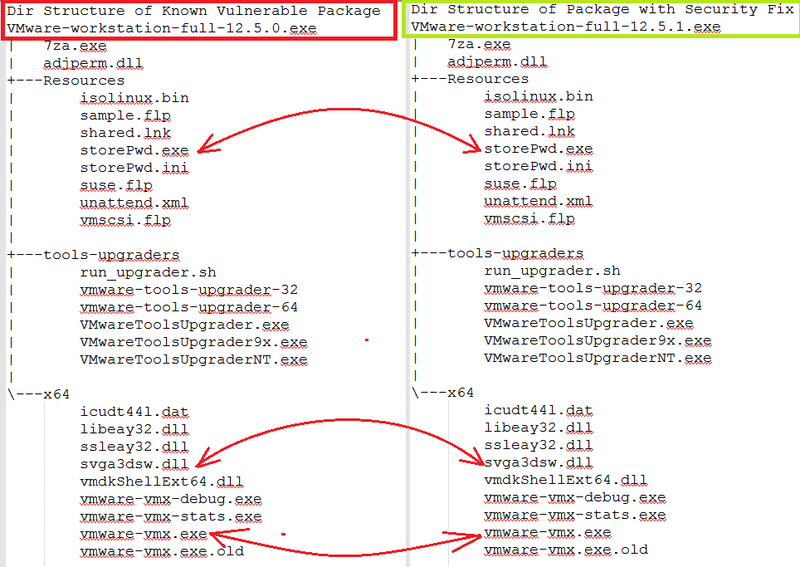 As it can be easily pointed out that in this release VMWare had only applied fix to two binary files they are vmware-vmx.exe and vmwarebase.dll and only few functions in these binary files were modified. This reduces a lot of repetitive work. The program was developed and tested on IDA Pro Version 6.5 + Bindiff version 4.2. This December 2017 Me & my colleague Yakun Zhang delivered a talk at Blackhat Europe 2017 Briefings on VMWare escapes. Blackhat Europe is an annual information security conference, scheduled on December 4 2017 to December 7, 2017, in the ExCeL London, located at 1 Western Gateway, London E16 1XL.We have talked about reverse engineering of vmware, attacking hypervisor isolation and some virtual machine escape attacks against vmware. Virtual machine escape is the process of breaking out of the virtual machine and interacting with the host operating system. VMWare recently fixed several bugs in their products that were allowing malicious code to escape sandbox. Some of these issues were exploited and reported during exploitation contest and while others reported individually by researchers. For very obvious reason details of this bugs are undisclosed. 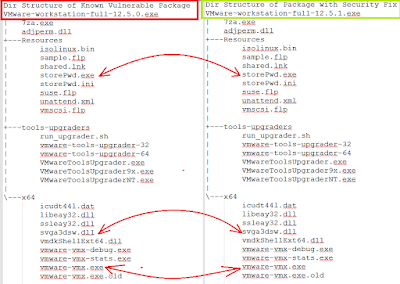 This paper presents a case study of VMWare VM escape vulnerabilities based on the analysis of different patches released by VMWare in recent past. Talking about vulnerabilities fixed in VMWare RPC layer, we see several CVEs (CVE-2017-4901, CVE-2016-7461 etc.) fixing security issues in RPC layers. This talk will cover end to end RPC implementation in VMWare workstation. It will cover everything from VMWare Backdoor in guest OS to different RPC command handler in host OS. We will uncover some of these fixed bugs in VMWare RPC layer by performing binary diffing on VMWare Workstation binaries. This talk will also showcase some of the PoCs developed from different VMware workstation patches. VMWare's EMF file handler is one of most popular attack surfaces, when it comes to guest to host escape. VMSA-2016-0014 fixed several security issues in EMF file handling mechanism. EMF format is composed of many EMR data structures. TPView.dll parses every EMR structure in EMF file. In VMware, COM1 port is used by Guest to interact with Host printing proxy. EMF files are spool file format used in printing by windows. When a printing EMF file request comes from Guest, in host TPView.dll render the printing page. 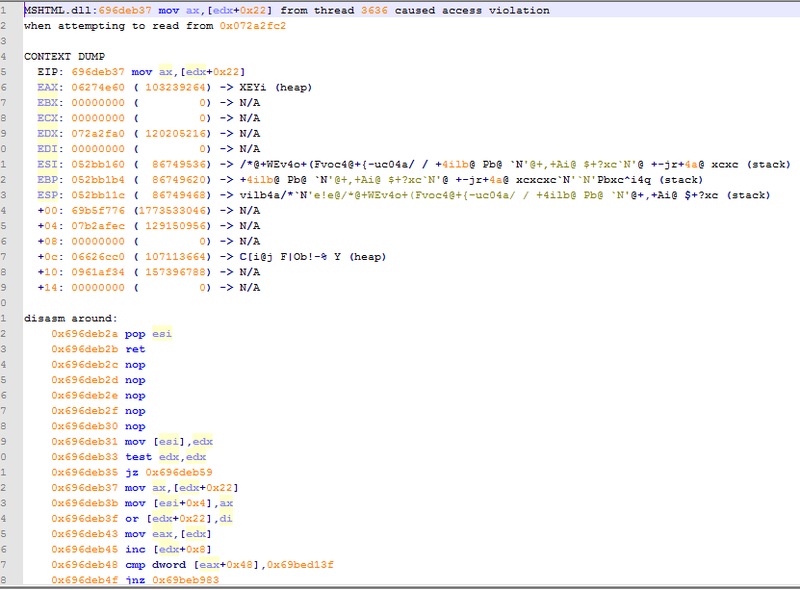 The TPView.dll holds the actual code which parses the EMF file structures. In our talk, we will be diving deep into this attack surface & uncover some of the vulnerabilities fixed in this area recently by performing binary diffing on VMWare work station binaries. VMSA-2017-0006 resolved several security vulnerabilities in Workstation, Fusion graphics implementation which allows Guest to Host Escape. These vulnerabilities were mostly present in VMWare SVGA implementation. In this section of our talk we will cover implementation of VMWare virtual GPU through reverse engineering different guest components (vmx_fb.dll - VMware SVGA II Display Driver, vmx_svga.sys - VMware SVGA II Miniport) as well as host component (vmware-vmx.exe) where virtualize GPU code exist. The VMware virtual GPU provides several memory ranges which is used by Guest OS to communicate with the emulated device. These memory ranges are 2D frame buffer and FIFO Memory Queue. In FIFO memory queue, we write command that we want our GPU to process. The way VMWare handles and process these commands is error prone. This talk will uncover some of these bugs in SVGA command processing code and try to understand anatomy of issues by bin-diffing through VMWare binaries. OpenXMolar is a Microsoft Open XML file format fuzzing framework, written in Python. MS OpenXML office files are widely used and the attack surface is huge, due to complexity of the softwares that supports OpenXML format. Office Open XML files are zipped, XML-based file format. I could not find any easy to use OpenXML auditing tools/framework available on the internet which provides software security auditors a easy to use platform using which auditors can write their own test cases and tweak internal structure of Open XML files and run fuzz test (Example : Microsoft Office). Hence OpenXMolar was developed, using which software security auditors can focus, only on writing test cases for tweaking OpenXML internal (XML and other ) files and the framework takes care of rest of the things like unpacking, packing of OpenXML files, Error handling, etc. Debugger is an immense part of any Fuzzer. Open X-Molar supports two python debugger, one is winappdbg and another is pydbg. Sometimes installing pydbg on windows environment can be painful, and pydbg code base is not well maintained hence winappdbg support added to Open X-Molar. Its recommended that user use winappdbg. crash_binning is part of sulley framework. crash_binning.py is used only when you've selected pydbg as debugger. crash_binning.py is used to dump crash information. This is only required when you are using pydbg as debugger. This is not core part of the Open X-Molar. The XML String Mutation module (FileFormatHandlers\xmlHandler.py) was written using xmltodict library. On a high level, OpenXMolar can be divided into few components. This is the core component of this Tool and responsible for doing many important stuffs like the main fuzzing loop. This component mostly handles processing of OpenXML document such as packing, unpacking of openxml files, mapping them in memory, converting OpenXML document to python data structures etc. This component suppresses/kills unwanted pop-ups appeared during fuzzing. An OpenXML file may contain various files like XML files, Binary files etc. FileFormatHandlers are basically a collection of mutation scripts, responsible for handling different files found inside an OpenXML document and mutate them. OXDumper.py decompresses OpenXML files provided in folder "OpenXMolar\BaseOfficeDocs\OpenXMLFiles" and output a python list of files present in the OpenXML file. OXDumper.py accepts comma separated file extensions. OXDumper.py is useful when you are targeting any specific set of files present in any OpenXML document. The default configuration file 'config.py' is very well commented and explains all of its parameters really well. Please review the default config.py file thoroughly before running the fuzzer to avoid unwanted errors. As said earlier, an OpenXML file package may contain various files like XML files, Binary files etc. FileFormatHandlers are basically a collection of mutation scripts, responsible for handling different files found inside an OpenXML document and mutate them. Generating effective test cases is the most important step in any fuzz testing process. The motive behind OpenXMolar was to provide security auditors an easy & flexible platform on which fuzz tester can write their own test cases very easily for OpenXML files. When it comes to effective OpenXML format fuzzing, the main part is how we mutate different files (*.xml, *.bin etc) present inside OpenXML package (zip alike). To give users an idea of how file format handlers are written, two file format handlers are provided with this fuzzer, however they are very dumb in nature and not very effective. # Import whatever you want. # and it should return fuzzed data/xml string/whatever. # Note: Data type of actual_data_stream and data_after_mutation should always be same. The default PopUpKiller.py file provided with Open X-Molar, is having few most occurred pop up / error windows handler for MS Word, MS Excel & Power Point. Using AutoIT Window Info tool (https://www.autoitscript.com/site/autoit/downloads/) you can add more POPUP / Errors Windows Handlers into 'PopUpKiller.py'. One example is given below. This fuzzer is well tested on 32 Bit and 64 Bit Windows Platforms (32 Bit Office Process). All the required libraries are distributed with this fuzzer in 'ExtDepLibs/' folder. Hence if you have installed python v2.7, you are good to go. To verify everything is at right place, better to run Open X-Molar with Microsoft Default XPS Viewer first time(C:\Windows\System32\xpsrchvw.exe). Place any *.oxps file in '\BaseOfficeDocs\OpenXMLOfficeFiles' and run OpenXMolar.py. OpenXMolar.py accepts one command line argument which is the configuration file. [Warning] Pydbg was not found. Which is required to run this fuzzer. Install Pydbg First. Ignore if you have winappdbg installed. An MS OpenXML File Format Fuzzing Framework. [+] 2017:05:05::23:11:23 POP Up killer Thread started..
[+] 2017:05:05::23:11:24 Loading File Format Handler Done !! Add custom error / popup windows handler in PopUpKiller.py using Au3Info tool if required.And you're good to go. Fuzzing Efficiency: To maximize fuzzing efficiency OpenXMolar doesn't read the provided base files again and from disk. While starting up, it loads all base files in memory and convert them into easy to manage python data structures and mutate them straight from memory. Auto identification of internal files of OpenXML package : An Open XML file package may contain various files like XML files, Binary files etc. OpenXMolar has capability to identify internal file types and based that chooses mutation script and mutate them. Please refer to the default config.py file (Param : AUTO_IDENTIFY_INTERNAL_FILE_FORAMT) for details. This software is licensed under New BSD License although the following libraries are included with Open X-Molar and are licensed separately. I had a fun project months back, Where I had to deal with digital signal processing and low level audio processing. I was never interested in DSP and all other control system stuffs, But when question arises about breaking things, every thing becomes interesting :) . In this post i'm going to share one technique to fully/ partially bypass reCaptcha test. This is not actually a vulnerability but its better if we call it "Abuse of functionality". Disclaimer : Please remember this information is for Educational Purpose only and should not be used for malicious purpose. I will not assume any liability or responsibility to any person or entity with respect to loss or damages incurred from information contained in this article. A CAPTCHA is a program that protects websites against bots by generating and grading tests that humans can pass but current computer programs cannot. The term CAPTCHA (for Completely Automated Public Turing Test To Tell Computers and Humans Apart) was coined in 2000 by Luis von Ahn, Manuel Blum, Nicholas Hopper and John Langford of Carnegie Mellon University. reCAPTCHA is a free CAPTCHA service by Google, that helps to digitize books, newspapers and old time radio shows. More details can be found here. reCAPTCHA also comes with an audio test to ensure that blind users can freely navigate. Chrome has a really interesting new feature for HTML5 speech input API. Using this user can talk to computer using microphone and Chrome will interpret it. This feature is also available for Android devices. If you are not aware of this feature you can find a live demo here. I was always very curious about the Speech recognition API of chrome. I tried sniff the api/voice traffic using Wireshirk but this API uses SSL. :(. So finally I started browsing the Chromium source code repo. Finally I found exactly what I wanted. Another important thing is this api only accepts flac audio format. 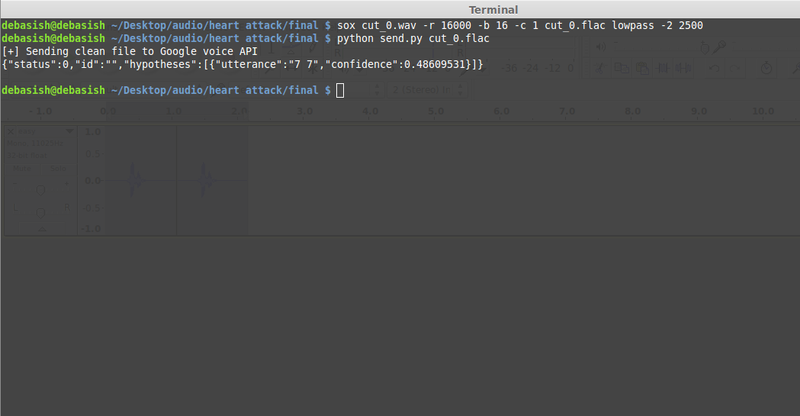 Below python script was written to send a flac audio file to Google Web Speech API and print out the JSON response. While dealing with audio reCaptcha, you may know , it basically gives two types of audio challenges. One is pretty clean and simple (Example : https://dl.dropboxusercontent.com/u/107519001/easy.wav) . percentage of noise is very less in this type of challenges. Another one is very very noisy and its very difficult for even human to guess (Example : https://dl.dropboxusercontent.com/u/107519001/difficult.wav). Constant hissss noise and overlapping voice makes it really difficult to crack human. You may wanna read this discussion on complexity of audio reCapctha. In this post I will mainly cover the technique / tricks to solve the easier one using Google Speech API. Although I've tried several approaches to solve the complex one, but as I've already said, its very very had to guess digits even for human :( . Google Re-captcha allows user to download audio challenges in mp3 format. 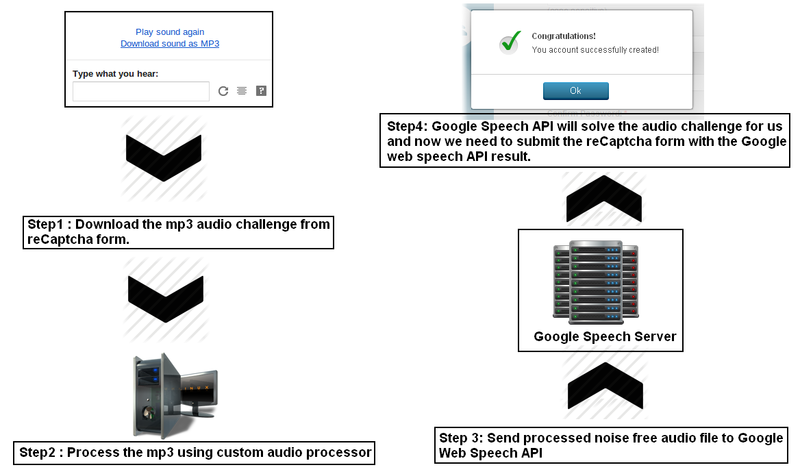 And Google web speech API accepts audio in flac format. So if we just normally convert the mp3 audio challenge to flac format of frame rate 16000 its does not work :( . Google Chrome Speech to text api does not respond to this sound. But after some experiment and head scratching, it was found that we can actually make Google web speech api convert the easy captcha challenge to text for us, if we can process the audio challenge little bit. 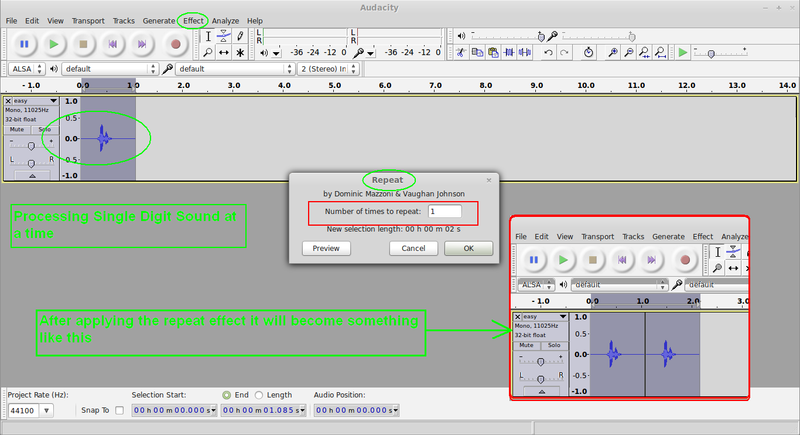 In this section i will show how this audio manipulation can be done using Audacity. To manually verify that first I'm going to use a tool called Audacity to do necessary changes to the downloaded mp3 file. Step 1: Download the challenge as mp3 file. Step 2: Open the challenge audio in Audacity. Step 3: Copy the first digit speaking sound from main window and paste it in a new window. So here we will only have a one digit speaking sound. Step 4: From effect option make it repetitive once. (Now It should speak the same digit twice). Lets say for example if the main challenge is 7 6 2 4 6, Now we have only first digit challenge in wav format which having the digit 7 twice. Step 5: Export the updated audio in WAV format. Step 6: Now convert the wav file to flac format using sox tool and send it to Google speech server using the python script posted in section 6. And we will see something like this. Note: In some cases little bit amplification might be required if voice strength is too low. Great! As you can see first digit of the audio challenge has been resolved by Google Speech. :) :) :) Now in same manner we can solve the entire challenge. In next section we will automate the same thing using python and it's wave module. Before we jump into processing of raw WAV audio using low level python API, its important to have some idea of how digital audio actually works. 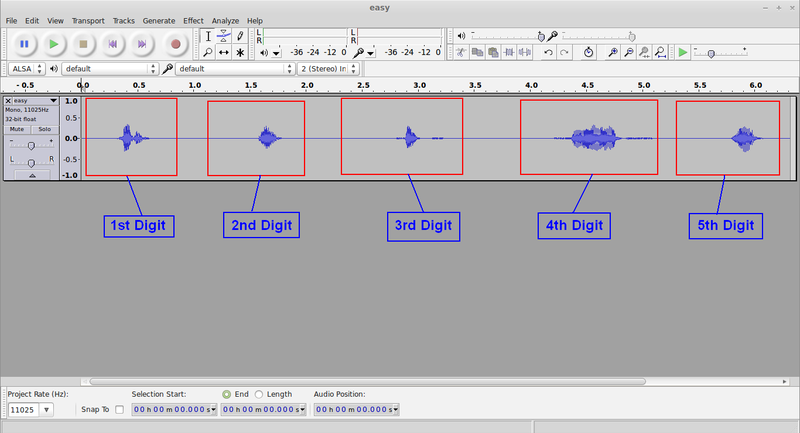 In above process we've extracted the most louder voices using audacity but to do it automatically using python, we must have some understanding of how digital audio is actually represented in numbers. There is an excellent stackoverflow post which explains the same. In short ,we can say audio is nothing but a vibration. Typically, when we're talking about vibrations of air between approximately 20Hz and 20,000Hz. Which means the air is moving back and forth 20 to 20,000 times per second. If somehow we can measure that vibration and convert it to an electrical signal using a microphone, we'll get an electrical signal with the voltage varying in the same waveform as the sound. In our pure-tone hypothetical, that waveform will match that of the sine function. Now, we have an analogue signal, the voltage. Still not digital. But, we know this voltage varies between (for example) -1V and +1V. We can, of course, attach a volt meter to the wires and read the voltage. Arbitrarily, we'll change the scale on our volt meter. We'll multiple the volts by 32767. It now calls -1V -32767 and +1V 32767. Oh, and it'll round to the nearest integer. Now after having a set of signed integers we can easily draw an waveform using the data sets. Now, if we attach our volt meter to a computer, and instruct the computer to read the meter 44,100 times per second. Add a second volt meter (for the other stereo channel), and we now have the data that goes on an audio CD. This format is called stereo 44,100 Hz, 16-bit linear PCM. And it really is just a bunch of voltage measurements. 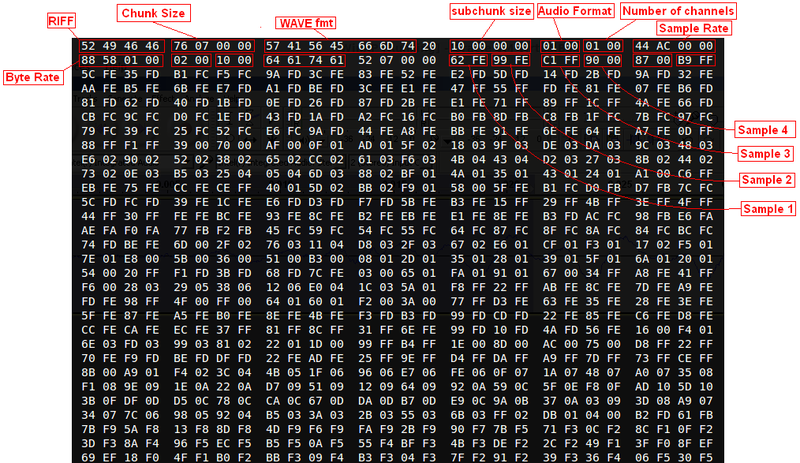 As an example lets open up a very small wav file with a hex editor. The wave module provides a convenient interface to the WAV sound format. It does not support compression/decompression, but it does support mono/stereo. Now we are going to parse the same wav file using python wave module and try to relate what we have just seen in hex editor. Line 1 imports python wav module. Line 2: Opens up the sample.wav file. Line 3: getparams() routine returns a tuple (nchannels, sampwidth, framerate, nframes, comptype, compname), equivalent to output of the get*() methods. Line 4: getnframes() returns number of audio frames. Line 5,6,7: Now we are iterating through all the frames present in the sample.wav file and printing them one by one. It should make sense now. In first line we get number of channels, sample width , frame/sample rate,total number of frames etc etc. Which is exact same what we saw in the hex editor (Section 9.2). From second line it stars printing the frames/sample which is also same as what we have seen in hex editor. Each channel is 2 bytes long because the audio is 16 bit. Each channel will only be one byte. We can use the getsampwidth() method to determine this. Also, getchannels() will determine if its mono or stereo. Now its time to decode each and every frames of that file. They're actually little-endian. So we will now modify the python script little bit so that we can get the exact value of each frame. We can use python struct module to decode the frame values to signed integers. Now what we can see we have a set of positive and negative integers. Now you should be able to connect the dots. What I have explained in section 9.1. So now if we plot the same positive and negative values in a graph will find complete wave form. 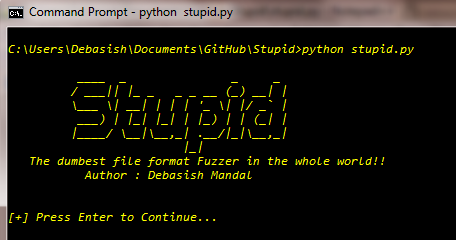 Lets do it using python matlab module. Now you must be familiar with this type of graph. This is what you see in SoundCloud, But definitely more complex one. So now we have clear understanding of how audio represented in numbers. Now it will be easier for readers to understand how the python script ( shared in section 9.3 ) actually works. In this section we will develop a script which automate the steps we did using Audacity in Section 8. Below python script will try extract loud voices from input wav file and generate separate wav files. Once the main challenge is broken into parts we can easily convert it to flac format and send each parts of the challenge to Google speech API using the Python script shared in section 6. So we have successfully broken down the easy challenge.Now its time to give the difficult one a try. So I started with one noisy captcha challenge. 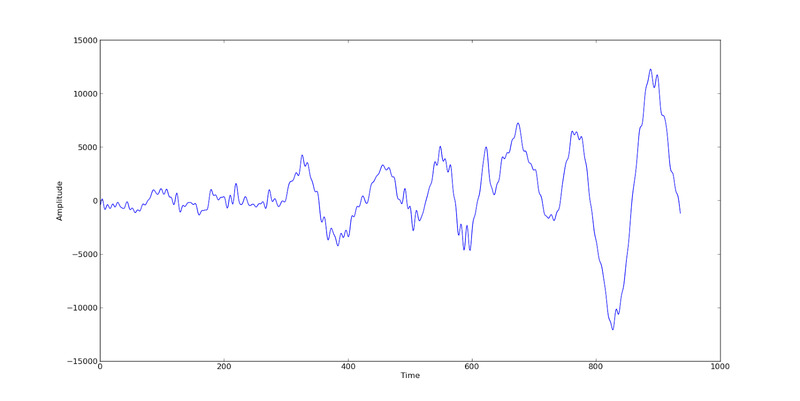 You can see the matlab plot of the same noisy audio challenge below. In above figure we can understand presence of a constant hisss noise. One of the standard ways to analyze sound is to look at the frequencies that are present in a sample. The standard way of doing that is with a discrete Fourier transform using the fast Fourier transform or FFT algorithm. What these basically in this case is to take a sound signal isolate the frequencies of sine waves that make up that sound. Lets get started with a simple example. Consider a signal consisting of a single sine wave, s(t)=sin(w∗t). 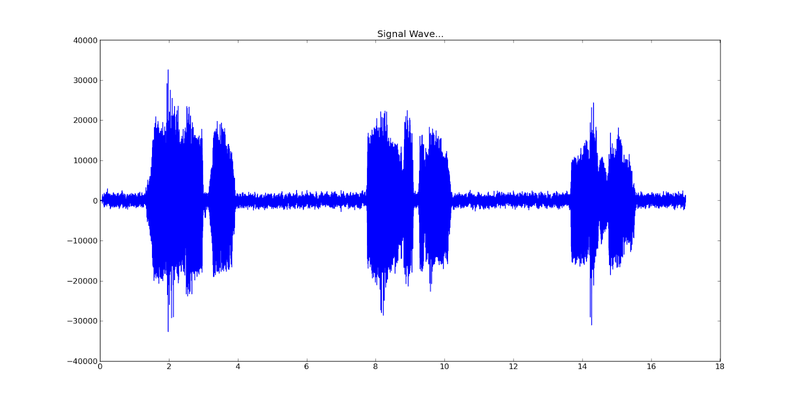 Let the signal be subject to white noise which is added in during measurement, Smeasured(t)=s(t)+n. Let F be the Fourier transform of S. Now by setting the value of F to zero for frequencies above and below w, the noise can be reduced. Let Ffiltered be the filtered Fourier transform. Taking the inverse Fourier transform of Ffiltered yields Sfiltered(t). The way to filter that sound is to set the amplitudes of the fft values around X Hz to 0. In addition to filtering this peak, It's better to remove the frequencies below the human hearing range and above the normal human voice range. Then we recreate the original signal via an inverse FFT. I have written couple of scripts which successfully removes the constant hiss noise from the audio file but main challenge is the overlapping voice. Over lapping voice makes it very very difficult even for human to guess digits. Although I was not able to successfully crack any of given difficult challenges using Google Speech API still I've shared few noise removal scrips (using Fourier Transform). These scripts can be found in the GitHub project page. There is tons of room for improvement of all this scripts. When I reported this issue to Google security team, they've confirmed that, this mechanism is working as intended. The more difficult audio patterns are only triggered only when abuse/non-human interaction is suspected. So as per the email communication noting is going to be changed to stop this. Thanks for reading. I hope you have enjoyed. Please drop me an email/comment in case of any doubt and confusion.